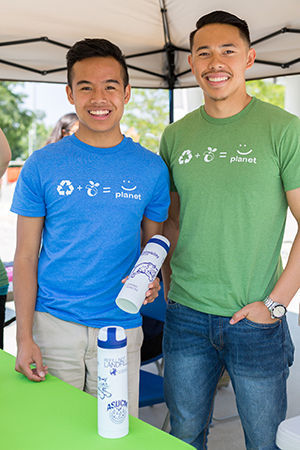 Students Gabriel Morabe and Hoaithi “Thi” Dang share a love of green — the color that makes for a better campus and stronger planet. Morabe, a junior, and Dang, a freshman, are devoted to sustainability at UC Merced and beyond. Both have led impressive efforts to conserve water, power and more on the University of California’s newest campus. Colleen McCormick, the campus’s director of sustainability, praised both students as committed, responsible and imaginative. Morabe, an ecology and evolutionary biology major from South San Francisco, is involved in a variety of projects as the Alliance to Save Energy’s PowerSave intern and team manager on campus. The program promotes energy efficiency, water conservation, green workforce development and the concept of infusing sustainability into academics. In addition, Morabe is one of three UC Merced undergraduates who received a fellowship under UC President Janet Napolitano’s Carbon Neutrality Initiative. Earlier this year, he led the UC Merced effort in a systemwide contest to curb energy use. The “Do It in the Dark” campaign helped prompt a 6.2 percent reduction, and UC Merced finished second only to UC Santa Barbara in the competition. Through outreach efforts both on campus and in the community, Morabe provides tips about ways to reduce power consumption and conserve water — from selecting energy-efficient light bulbs and taking shorter showers to doing laundry only with cold water and only in full loads. Morabe said he was planning to become a physical therapist when he first came to UC Merced. But his interests shifted when he joined the PowerSave program. When finished at UC Merced, Morabe plans to take courses to prepare for certification and a career in project management, and he hopes to work at Pacific Gas & Electric. “I felt that I could have a bigger impact on the community and the world through sustainability,” he said. Dang is a first-year student who already has made a difference on campus. After noticing that some students lacked reusable water bottles, Dang thought about finding a way to provide refillable bottles to a few hundred fellow freshmen as a way of contributing to the reduction of landfill waste. That idea quickly grew much bigger. Michael Reese, vice chancellor for Business and Administrative Services, liked the concept and provided $15,000 to pay for 1,300 water bottles. Other campus entities, such as dining services, housing and the Associated Students of UC Merced (ASUCM), are planning to buy more reusable bottles and add or retrofit water bottle refill stations around campus. At the campus’s Earth Day celebration in April, some 1,150 insulated bottles — decorated in part with the signature Bobcat mascot and “Class of 2018” — were available to freshman. Another 150 bottles without the “Class of 2018” logo also were handed out. Dang, a first-generation college student from San Jose, said he wants fellow students to be educated about sustainability so they can make informed choices. In addition to serving as the ASUCM commissioner on sustainability, Dang is working on a campaign to promote local food after receiving a fellowship through the UC Global Food Initiative. As a boy, Dang developed a love of the outdoors while hiking with his father. He’s now considering a major in environmental engineering, and his future plans may include working on projects that can be certified for energy and environmental efficiency.